At Knight we understand that the dispensing equipment you use in your chemical program can mean the difference between success and failure. Knight's chemical proportioning systems are designed to promote efficient, cost effective mixing and dispensing of cleaning and sanitizing chemical concentrates. Knight's dispensing systems offers the highest level of flexibility and control for meeting a variety of customer requirements in places such as hospitality, institutional facilities, restaurants, supermarkets, and other environments..
Today, Knight manufacturers the industry's most extensive lineup of laundry chemical dispensers for liquid and solid laundry chemistry. Knight's line of dispensing systems features user-friendly electronic controls for basic On-Premise machines, as well as the advanced technology for large washers and tunnel machines. 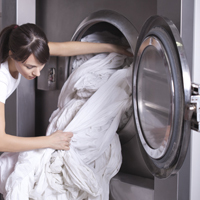 Complete data management systems are available to provide the laundry operator and chemical supplier with complete report capability. At Knight we understand that the dispensing equipment you use in your chemical program can mean the difference between success and failure. Knight's chemical dispensing systems are designed to promote efficient, cost effective mixing and dispensing of cleaning and sanitizing chemical concentrates. 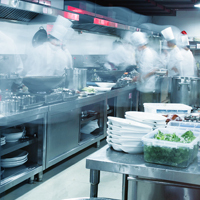 Knight's dispensing systems offers the highest level of flexibility and control for meeting a variety of customer requirements in places such as hospitality, institutional facilities, restaurants, supermarkets, and other environments. 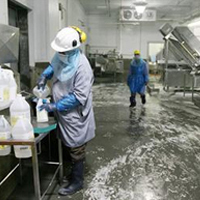 Chemical control systems that assume proper cleaning and sanitation are quick becoming standard equipment in today's Food and Beverage Processing Industry. Knight manufactures a comprehensive line of pumps, controls, foam cleaning equipment, sanitizer dispensing equipment, conveyor line lube dispensing units, and PC based data management systems that permit sanitation workers to apply the correct cleaning and sanitizing solutions to food contact surfaces with greater safety and controlled costs. 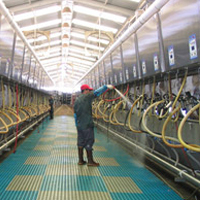 Knight has gained the reputation as the innovative leader for chemical control and pump equipment for dairy farms the world over. Our expertise in the field coupled with sound systems engineering make Knight the wise choice for chemical manufacturers and dairy equipment dealers everywhere.